Welcome Final 3! Congrats on making it this far! I just cannot believe we are about to announce the Final 2 of Cycle 3! This week, your determination and creativity were tested, and Ive gotta say- you ALL passed both tests! However, there are only obviously only TWO places in the Final 2 and we are about to decide who gets those positions. First, lets take a look at your shots. MrJanice: I agree with Bree. I wouldn't have expected anyone to use an entire fish, I expected little things like shri...prawn and things like that, you're brave, girl! I wouldn't have used fish, that's gross haha. Anyway, normally your expressions are strong and yeah you look androgynous, but this week it's so soft. I don't think you look androgynous at all, you just look like a very vulnerable girl. Your expression, the hair, the makeup, everything's lovely. Great job! 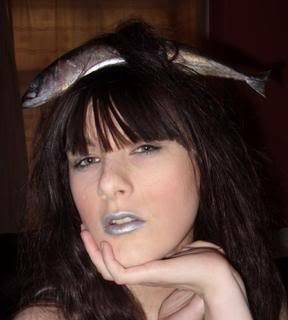 Cozy: I gotta give you props for putting that fish in your hair. I don't think I could do that. You look fierce, the hand is very graceful, and it's an obvious beauty shot. Good work this week! If I had to give one critique I'd say your eyes are a little bit too squinty, but otherwise well done. Andy: Chantal I have been a fan of yours since your car shot. I think this photo proves your modeling capabilities and shows the judges how diverse your are with your poses and such. I love what you did with the fish and how you overcame your fear, congratulations! SweetTyra: Yeah, I doint think theres really any more I could add, its an absolutely beautiful and interesting shot and I couldnt have asked for any more. You gave us variety and you looked different in some of the shots, it was a good film. Bree: Oh WOW. I wasn't expecting you to do well on this, but this actually is a wonderful beauty shot which makes a GREAT addition to your portfolio - definitely your best shot to date. The expression is soft but it still has a great deal of power behind it, you look etherial, and your neck looks great. There are a few problems - for one, you didn't really use the fish to their greatest potential. For another, your eyelids are a little uneven. However, I'm still shocked at how nice this is - especially the QUALITY of the photo. No more blurries! You should be proud because this photo proves that you deserved to make it this far. Andy: Killian, Killian, Killian. Its the end of the line, you did the best you could and I personally think this is your best shot of the entire competition. Unfortunately I don't think its on the same level as Chantal's. Cozy: I don't understand why this is so washed out, I think you tried to Photoshop it and didn't do it right. You've lost all contrast. But yay it's not blurry! I'm a little confused at the look in your eyes, this is supposed to be a beauty shot but you look...sarcastic? I wish you would've chosen a more dramatic representation of fish, or used it as more of a costume. Much better than usual though! SweetTyra: I do think this is one of your bestshots, however I agree that you didnt really use the muscles to your advantage. You said they kept falling off your head and you found a way to overcome that, but I foind it isnt as dynamic and "shocking" as it could have been. Your facial control across the range of your shots was much improved on though. Cozy: For a beauty shot, I don't think this works because your eyes are too far away from the camera. Profile is not your best angle, but I commend you for trying something different. I can definitely see what you were trying to do with your look, and I really do like the shrimp and the shells and your spiky hair, but overall it fell a little short of expectations I'm afraid. MrJanice: I know you probably had some trouble with this being a vegetarian and all, but I liked that you, all of you guys, sucked it up and just did it. Now, I've never been a fan of profile shots, and this time it's no exception. It's a beauty shot, and I know it doesn't have to be this way, but I think it would have made much more of an impact if you had looked at the camera. The expression isn't bad, but it's not that great because we can't really see it. Now, the makeup, the way your shoulder's raised, and the accessories(necklaces things), all make this look very feminine. You're not a feminine guy so don't try going for that. Go for something strong and masculine, since it fits you better. SweetTyra: I sort of agree about the feminine thing, looking through your film, all I could think of was "Ocean themed Mardi Gras." I think you DO still have a bit of masculinity there, though, so its not all lost. Now, the judges dont know this, but karasu sent in LOADS of shots, and I commend you for that. He had lots of angles. HOWEVER it was pretty much the same look from 20 diferent angles and a lot of the shots were very similar. I disagree about it being profile though, I really liked the profile and I can just imagine you looking at the product you are using, and when I see that, I kind of see the hunger you have for it haha. Like, "My face is so fishy i need that moisturiser NOW!!!" Lol. Bree: While this is a wonderful picture which shows how modelesque you are, I don't feel like it's unique. I feel like we've seen this before - and from you. The others take risks with things and sometimes they don't always work, but I get the feeling that you play it safe a bit too much. Nonetheless it's a really powerful expression, but it doesn't read "fierce sea creature," it reads "Model 101." Andy: Same damn freakin facial expression only to the SIDE this time. Its interesting I like what you did with the fish, its just its the same pose every single week. I may be the only one who is picking up on this but I cant stand that almost every shot in your portfolio looks the same just with different clothes, makeup, etc. You are no doubt Final 2 material, just I wouldn't feel so comfortable if I were you. OK, THE JUDGES WILL NOW DELIBARATE. WHEN I CALL YOU BACK, THE FINAL 2 WILL BE REVEALED! There are 3 amazing models standing before me. However, I only have 2 photos in my hands. The name of the model I do not call must make their way back to the house, packup their belongings and leave immediately. CHANTAL!!! Congratulations love! You overcame one of your greatest fears this week and made it as fierce as hell! Killian and Karasu, please step forward. Karasu, you have been the most consistent person in this competition and are yet to produce a bad picture. However, the judges are still concerned that although your pictures are all great, they all look the same and you have failed to show great versatility. Killian, you are quite the opposite. You have shown great versatility over the weeks, but the judges always have one criticism about your pictures and you dont seem to be able to nail every component all at once. Youve made it very far and have improved so much, but was it enough to get into the final 2? KARASU!!! Congrats!!! Killian, you were amazing dude, thank you so much for everything you brought! There you have it guys, please put your hands together for our final 2!! congrats Karasu & Chantal!!! you both have done so well, either one of you could get it and very much deserve it! Woah I finally LOVE a shot by Karasu!! Absolutely stunning haha! Congratulations Karasu and Chantal on Final Two! Wow Killian! Great Shot!! I never ever expected that from you, you've improved SO much! Congrats Chantal and Karasu! Everyone did fantastic this week, you all looked so great! and i really didnt mean to raise my shoulder again lol it just sortof happened. you know i definitely commend killian. everyone (including myself) doubted him and he ended up pulling off a great shot. well done killian! Even though I'm quite sad that this is the end of my journey on INTM I am still really proud of myself for making it as far as I did. Thank you for all the compliments about my picture guys, it's much appreciated. Chantal and Karasu, I'm really happy and proud of you as the final two. I know that both of you can work it and I do NOT know who is going to win hehe. Judges, thanks for the chances. I've had such an awesome time and I'm really thankful for this, you have no idea. Such a good sport. That makes everything even happier!! Congrats Final 2! Chantal, another great shot! Is it possible for you to take a bad photo? JK . Karasu, your photo reminds me of Yoana (the photo where she's at some italian ruins in a designer dress). That's good cuz Yoana won, but bad cuz she's a girl Good luck to both of you! Killian, this photo was your best! congrats on making it so far. 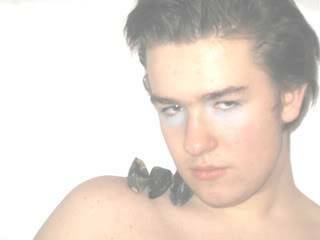 Hottamaletrain wrote: Killian, this photo was your best! congrats on making it so far. Hottamaletrain wrote: Congrats Final 2! Chantal, another great shot! Is it possible for you to take a bad photo? JK . Karasu, your photo reminds me of Yoana (the photo where she's at some italian ruins in a designer dress). That's good cuz Yoana won, but bad cuz she's a girl Good luck to both of you! holy crap chantal, you are freaken working that lipstick! Isn't it weird how it's blue bit it looks natural? Like it's supposed to be there? i think you top two deserve to be here for sure and i want both of you to win, so whoever wins, i'm happy and good luck!